Planning a wedding is a major project! It was exactly one year from the proposal to the wedding day, which worked out to be a great amount of time to make all of the arrangements without it getting too hectic. 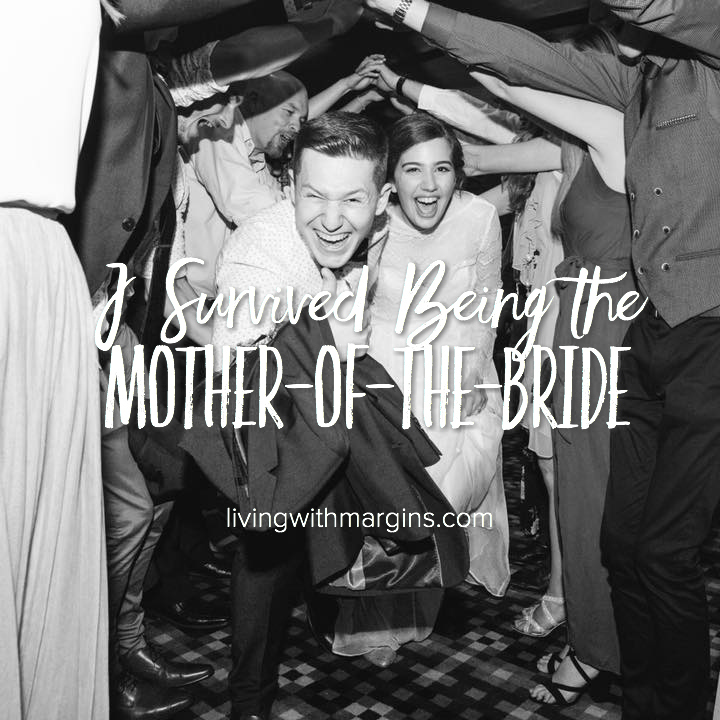 Applying my Living with Margins philosophy of life, there are some great choices we made while planning this wedding which helped to make it such a perfect day. I know it’s becoming more popular to marry on days other than the traditional Saturday, and for us, a Friday wedding was perfect. A lot of our friends and family are really involved in church life, and Sunday is a super important and busy day. With the wedding on Friday afternoon, we were all able to recover a bit on Saturday before the busyness of Sunday. The wedding was also in school holidays, so that families with children could attend. We loved having all of the cousins at the wedding. Initially we booked the Friday because it was cheaper, but in hindsight it was better than the Saturday would have been. We found a wonderful venue where there was a wedding chapel and function room within the same complex. It was so relaxing to be able to walk from the chapel to the pre-dinner drinks to the reception dinner without having to navigate around town. It made the day more relaxing, and gave us more time to hang out with friends and family who we don’t get to see very often. Even though the venue was only an hour away from home, we paid for accomodation close by for the night before and after the wedding. The bride and her bridesmaids stayed there the night before the wedding. They enjoyed breakfast together before the hair dressers and make up artist arrived the morning of the wedding. It was a relaxed and fun morning with no stress or hurry. Murray and I and the rest of our family stayed there the night after the wedding. Extended family who travelled from out of town stayed in the same complex. It made it more fun, and also just more relaxing and convenient on the day. Weddings have changed since we got married 25 years ago. Our wedding was a full church service with hymns and Bible readings and an organ playing “Here Comes the Bride.” Things are different now, and the bride and groom made choices that reflected their personality and style. Their wedding was very different, but was perfect for them. The ceremony was short, simple and meaningful. The reception was casual and fun. The bride didn’t wear a veil, the groomsman didn’t wear suits, and there was no classical music to be heard. There were beautiful garlands of cascading fresh flowers and native greenery. It was just beautiful, and it suited them perfectly. All dressed up and ready to give our beautiful daughter away. Apart from the venue, the dressmaker and the DJ, everything was done by family and friends. The invitations, the cake, flowers and photography, the celebrant, cars, hair and make up, were all done by people we know. This made the day extra special. I think this is one of the biggest advantages of being part of a church community, but they don’t advertise that in any of the church brochures. As happy an occasion as a wedding is, I knew that I would be exhausted both physically and emotionally, so I planned a 'wedding recovery weekend' one week after the wedding for just Murray and I. That’s where I am now, sitting on the balcony overlooking the ocean, watching the tufts of whale breath, listening to the waves. A few days of resting, reading and long walks on the beach have helped me to decompress and rejuvenate. I feel like I’m learning. I’m making progress. I have intentionally planned and invested in my own self care through the whole process, and I honestly feel like it has been worth it. I don’t feel overwhelmed and emotionally depleted. I don’t feel stressed or depressed or anxious. I don’t feel sad. This is a big win for me! I look back at my journals from a year or two ago and know how often I only recognised the need for intentional self care in hindsight, after I reached breaking point and near burnout. Today, I celebrate the win! I have survived my daughter’s wedding. Tomorrow I will go home and work out what to do with the new spare room in my house, but today, I will walk on the beach and count my blessings.